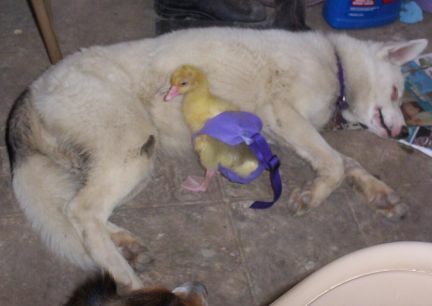 Goose Diapers, Duck Diapers, Chicken Diapers, yes, it is true! 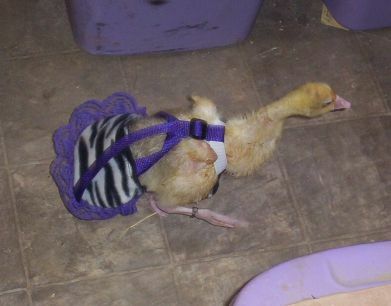 Geese, house Goose, Ducks, and Chick and Chickens wearing a Diaper placed in a Diaper Holder make just for them. I am sure there is a Turkey or two and perhaps a Guinea Hen, as well many Parrots, that all wear diapers and live in people houses. 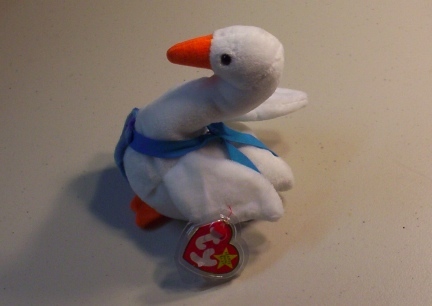 How does the diaper stay on the bird? 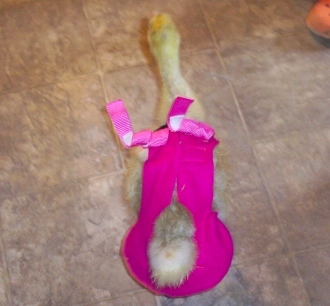 With a diaper holder harness. There are several types and some are better for one species of bird then another, but they really do work and allow your bird freedom in your home. We started making bird Diaper Holders for our own House Birds. We use patterns we designed that worked well for us, then we started making them to sell so that other House Bird Owner's lives would be easier AND CLEANER! 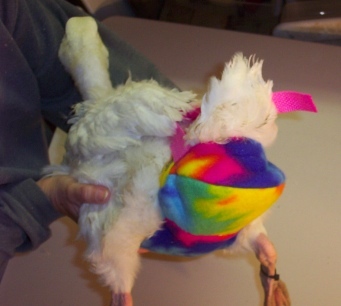 Keep reading to learn more about House Bird Diapers. Please visit our On Line Store to see the type we make. 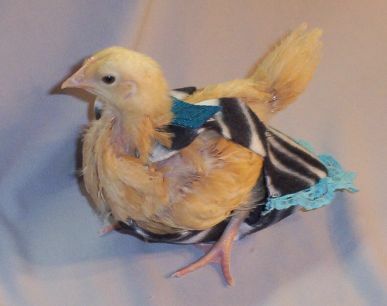 Our patterns were the first to include liners, for adult birds, that one can take in and out of the Diaper Holder for washing keeping the Diaper Holder usable for a longer amount of time between washings. We also make them into costumes with Pirate Hats, Santa Suits and more. PLEASE NOTE: WITH OUR DIAPER HOLDERS FOR ADULT BIRDS YOU CAN USE THE DIAPER HOLDER AS IS AND JUST RINSE OUT THE LINERS, OR! 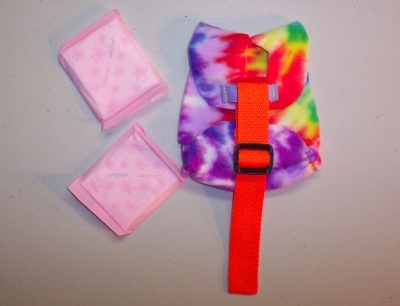 YOU CAN LINE THE DIAPER HOLDERS WITH FOLDED NEWSPAPER, SCRAP FABRIC (like cutting up an old T-Shirt into throw away diaper liners), OR YOU CAN CHOOSE TO LINE THEM WITH A HUMAN BABY DIAPER OR KOTEX OR ANYTHING ELSE THAT WORKS FOR YOU! I make our Diaper Holders with as little as possible on the bird with as much as it needs to take care of what it takes care of. Think Bikini. 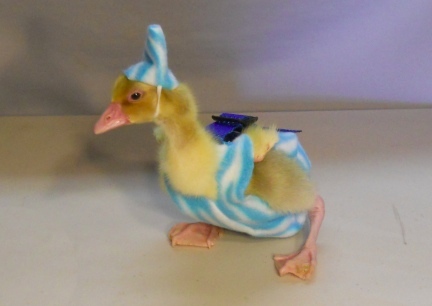 The most important thing to remember is that the diaper holder needs to fit the bird correctly. It needs to fit snug but allow movement. And you have to line it with something. Most folks use sanitary pads and or baby diapers. 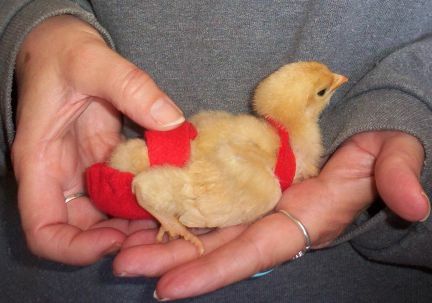 For some birds you can cut the actual diaper (pad or whatever you use) in half. 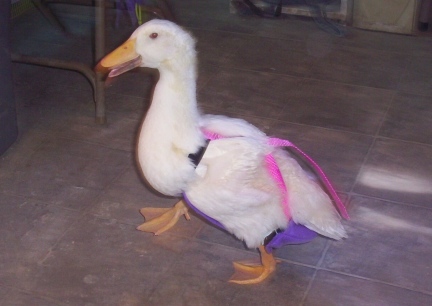 I have designed an environment friendly diaper for geese, ducks and chickens to use for our own birds and to sell in our on line store. The type I have designed allows the owner to use a folded (the shiny ads work best) piece of newspaper to catch the mess keeping disposable napkins and diapers out of the environment and costing the bird's owner nothing to line the Diaper Holder other then something that was going to be thrown out anyway. However, the same Diaper Holder will certainly hold the disposable napkins and or diapers if you prefer to use them. 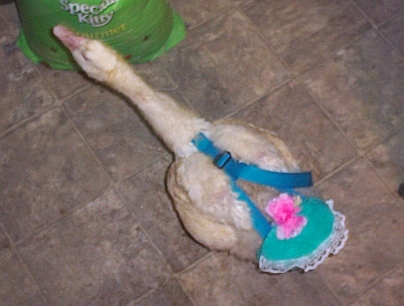 When a Fowl Diaper Becomes Foul. 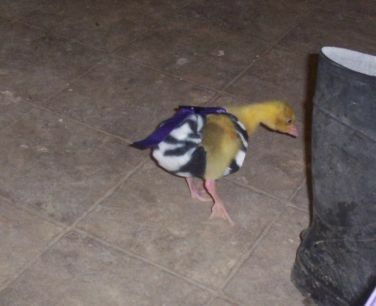 You will need to change the birds diaper when needed. How often? It depends on the bird, what the bird has been eating, and the type/species of bird it is. I used cloth diapers for my three human sons. Not only are throw away diapers expensive, they ruin the environment! I could get on my "High Horse" right now and tell you how discussed I get with the TV commercials of actors and actresses telling us all to use better light bulb and to turn off the water while we brush our teeth....and that is important but five will get you ten each and everyone of them are using disposable diapers on their babies and disposable sanitary pads for all the females of that age in their homes as well as dye their hair and dump that into our water systems. If everyone in the world would stop using these types disposable items, we would not only have less trash piles up....but think about what is wrapped up in that plastic then thrown out! NO! You do not have to use the newspaper in the Diaper Holders I make. You can use the liners alone and just rinse them out, cut a piece of fabric from some clothing item you are throwing away (it will break down into the environment better then the plastic will) OR! You could certainly use a disposable human baby diaper or kotex it you choose to. 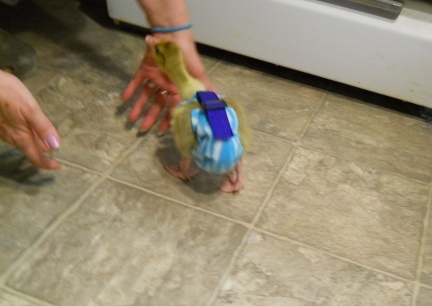 After much product testing here and in TN (a good friend with a house goose) we now offer our Diaper Holders, some with a ring for a leash, for sale in our on line store. You can see in the photos how the pouches are shaped. Yes, yes, I know <she grins> that the photo has 1/2 of a pantie liner laying next to it. I had taken the photo before coming up with the newspaper and waterproof liner idea....but, of course you could also use the pantie and or disposable diapers with our Chicken, Duck or Goose Diaper Holders. 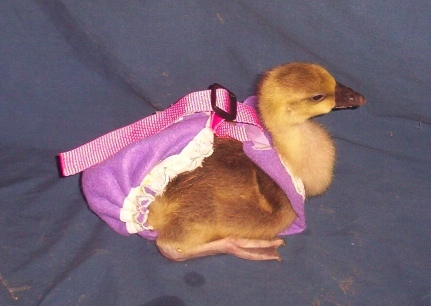 (read about the goose diapers for more information on GREEN BIRD DIAPERS. 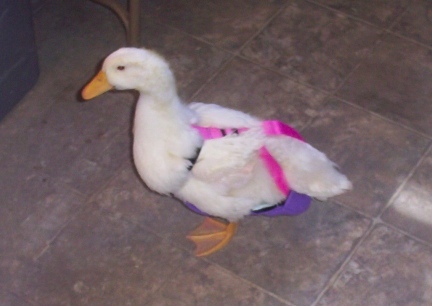 I finally figured out the best diaper holder pattern for our ducks/ducklings that will fit the birds well. 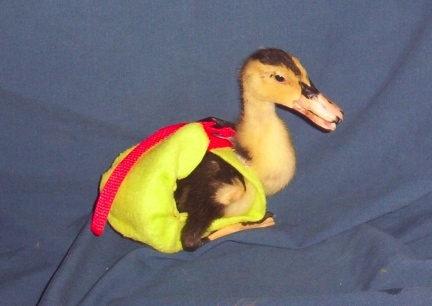 As you can see from Splash, our duckling here in the photo, I kept working on it. We wash the diaper holders both by hand (when needed quickly) and in the washing machine. Depending on the fabric of course, but most should be washed in cold or warm water. I load our bird's diaper holders in with our towels. 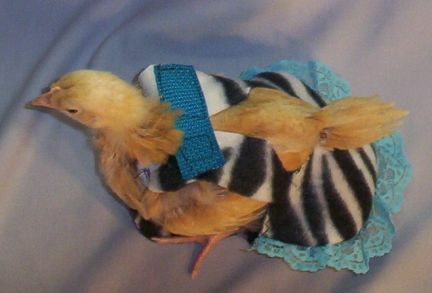 I hang all of our clothing, and I recommend you hang your bird diaper holders to extend the life of it. It will also look better, last longer, if you hang on the line or laid flat rather then machine drying them. We have found that to be true for all of our clothing. Our Diaper Holders are made from our own patterns. 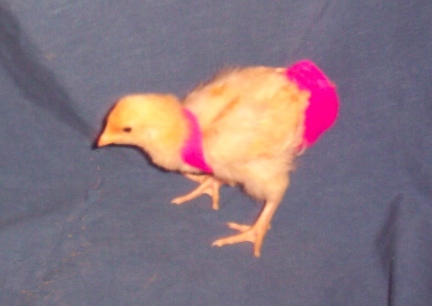 We designed them for our own birds. 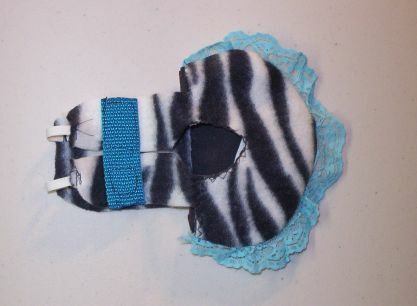 Our Diaper Holders and most others have a variety of not so inexpensive materials to put them together. I buy cute fabric, not cheap fabric. I line not only the inside of the poop pouch with waterproof fabric, but also each of the two liners that fit down into the pouch to make the time before washing the entire holder for longer use on the bird. I use a large, approx. 3" piece, of thick velcro (not the cheap skinny stuff) in the pouch as well as each liner so that the liners are sure to stay in place for less mess. 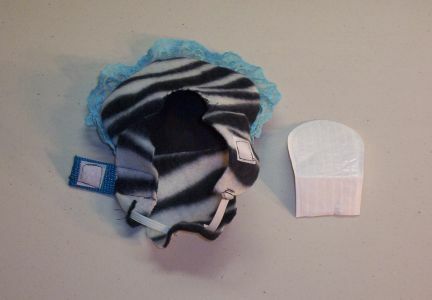 There is a thick piece of elastic to make the Diaper Holders comfortable for the bird wearing them as well as a nice piece of polar fleece in the front and under each strap with the buckle lays for the comfort of the bird. Each Bird Diaper Holder is made with at least one NON SHINY (so the birds eyes are not drawn to them to pick at it) High Impact 1" slide and a High Impact Side Release Adjustable Buckle that is also NON SHINY for easy adjustments and fast changing. 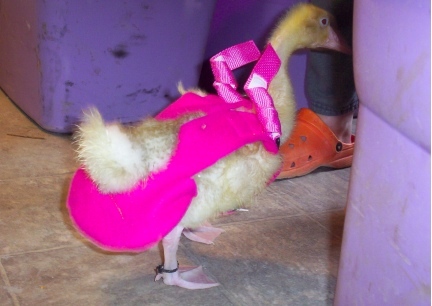 All the parts we use are for the comfort and safety of the Bird wearing them. Many times I add lace or other trimmings as well as a handcrafted hat or a hand trimmed hat. 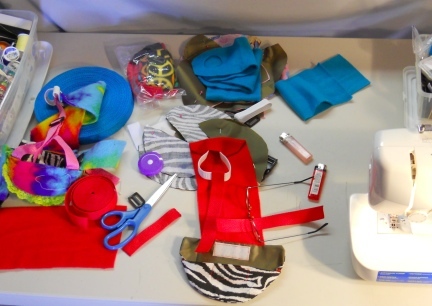 Add to the materials over an hours time to make the Diaper Holder and the thread, wrapping, website costs, advertising, and packaging to mail them to a buyer, and no one is getting wealthy making and selling bird Diaper Holders and selling them. 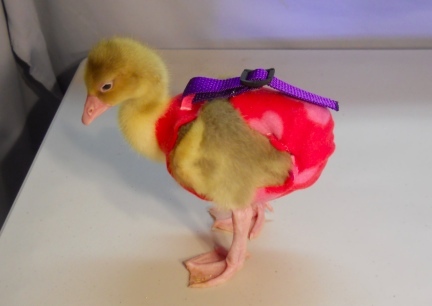 If you have seen the idea of using a sock to make a gosling or duckling Diaper Holder. 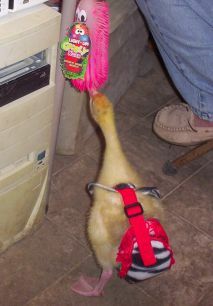 Sock diaper holders, in my opinion, are not good for the goslings bones. 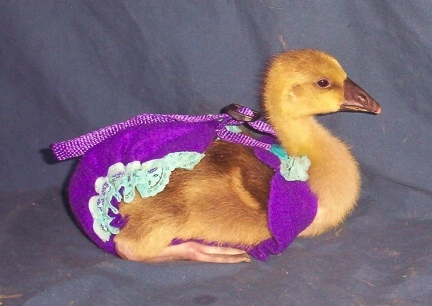 They are VERY cute, but do not have ajustability offered in most gosling/duckling Diaper Holders and socks have some give, but not a lot. 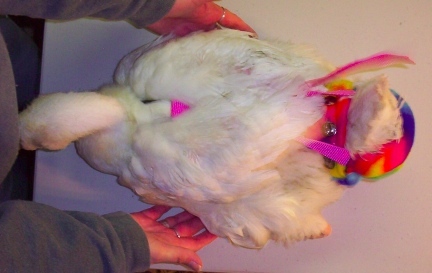 When used, the sock needs to be too tight around the birds body to stay on and hold the diaper and that sock holder pull down and back (from what I have seen in the photos) on the goslings growing wing bones. I believe there will be some people talking about angel wing and wondering how their birds developed it. 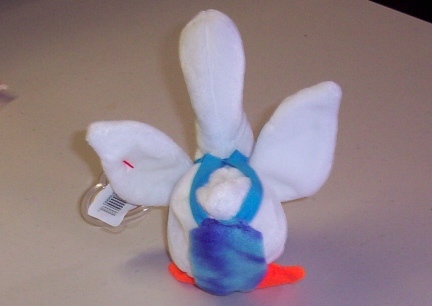 FREE BIRD DIAPER HOLDER PATTERNS FOR YOU TO USE????!!!! PLEASE DO NOT ASK FOR MY PATTERNS AND INFORMATION. 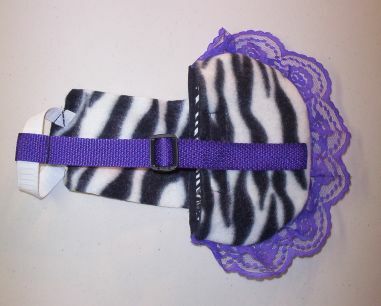 I MAKE AND SELL THESE DIAPER HOLDERS TO KEEP OUR WEBSITES UP ON THE INTERNET AND TO FEED OUR MANY ANIMALS HERE. I DO NOT SHARE OR ESPECIALLY GIVE MY PATTERNS AND IDEAS AWAY....I am always quite surprised when people ask....seems very rude.